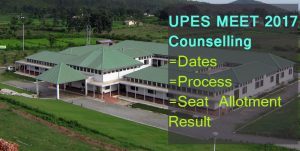 UPES MEET Counselling 2017- यूनिवर्सिटी ऑफ़ पेट्रोलियम एंड एनर्जी स्टडीज एम.टेक काउंसलिंग is going to be conducted by University of Petroleum and Energy Studies. The counselling is being organised for the admission in various department of pg engineering course. The applicant who is going to appear in UPES MEE Counselling 2017 is required to qualify either UPES MEET 2017 or GATE 2017. The UPES MEET Counselling Schedule will be done separately for the admission of both GATE and Non- GATE qualified candidates. We are on this page providing you with the details about UPES MEET Admission 2017 such as UPES M.Tech Counselling Form, eligibility, procedure and so more. The candidates who are interested can read the entire article carefully to appear in the counselling. The University of Petroleum and Energy Studies is located at Dehradun in Uttarakhand. The university is known as one of the Top Engineering Colleges in Uttarakhand. The University is known for its education and research in petroleum and energy studies. Th The UPES MEE Admission Procedure follows single window process and will tentatively be done in June 2017. The applicants can appear in the counselling through GATE 2017 or through the entrance examination conducted by the university. The UPES university follows single window process to held the counselling in the M.Tech course. After the announcement of UPES MEET 2017, the applicants would be able to be notified of the venue, date and time of reporting to the institution. After the UPES MEET Intimation Process applicant would have to report to the university. Later, he/ she will have to verify the documents, make payment of application fee and participate in UPES MEE Seat Allotment Result 2017. After all, this process applicant would get a confirm seat in the university. The applicant will need to fill the UPES MEE Application form 2017 to participate in UPES MEE Counselling. Each candidate is supposed to enter all the details with providing correct details because later it will going to be verified at the university. Registration Fee– The applicant is required to pay the application fee as per the norms of the university. Kindly, refer to the official notification for brief details. The applicant might be asked to choose the subject to pursue M.Tech course. The choice of the candidate will be accepted in order of their ranks. Higher rank holder will be called first to choose from all the available options. Each one of the candidates would require carrying the following documents for the verification process during the counselling. After successful document verification process, only the seat will be allotted in the university. The applicant must have qualified graduation degree with minimum 60% aggregate marks. The applicant must have qualified X & XII class with minimum 60% overall. The applicant has either qualified GATE 2017 or UPES MEE 2017 with minimum cutoff marks. After the successful completion of UPES M.Tech 2017 Counselling, The applicants will get a confirmed seat in the university. The UPES MEE 2017 Seat Allotment List will be available in the second week of June 2017. We will also update the same when UPES MEE Phase I, II, III Merit List on the same blog after it gets announced on the official website.